Gold coins are usually made from a high purity of gold. Historically, gold coins were circulated and used as money. However, over the past several decades, gold coins are primarily produced as bullion coins for investment purposes. A small number of modern gold coins are also legal tender. They are not used in typical financial transactions as the value of the gold usually exceeds the nominal value of the coin. Modern investors recognize the timeless value of gold as a prime part of a diversified investment portfolio. And when investors are new to gold, the most popular size they purchase tends to be 1 oz gold coins. Gold coins are an investment that preserve wealth, a hedge against inflation, and a safe haven during times of global uncertainty. Buying gold coins is a great way to purchase physical precious metals as opposed to non-physical gold ownership, such as gold exchange-traded funds (ETFs), gold exchange-traded notes (ETNs), futures contracts, and mining stocks. Precious metals, such as silver, gold, and platinum can also be purchased as bars and rounds. Gold coins can be stored in safety deposit boxes or in a secure place in your home. As a value investor, you should try to purchase gold coins as close the spot price as you can. Smaller gold coins, such as 1/10 oz, will have a higher premium -- but they may be easier to carry and use in a crisis, particularly given their smaller increment of value. Gold coins are an investment that preserve wealth, a hedge against inflation, and a safe haven during times of global uncertainty. Typically, gold coins come in sizes that include 1-ounce, ½ oz, ¼ oz, and 1/20 oz. In comparison to common U.S. coins, a 1 ounce bullion coin is similar to the size of a half dollar, and a 1/10 ounce coin is about the size of a dime. Most of the countries that mint gold have a design that stays the same each year. Some vary the designs annually and date the gold coin, such as the Chinese Panda coins. Proof (PF) uncirculated coins are typically more expensive than non-proof gold coins. They require extra time and effort to make and can have a slightly higher value than non-proof because of demand from collectors. However, both contain the same amount of precious metal so investing in proof coins is highly speculative and generally a play on collectible value as opposed to the metal itself. Gold coins are produced at a mint by two dies that strike a blank piece of metal with great force. One die as the obverse (front) design for the coin and the other has the reverse (back) design. Proof coins are struck two times or more by the die, while bullion coins are struck once. Gold bullion coins usually have a fineness of .999, which is 24 karats. Investing in gold coins from exotic, unknown mints can be a risky choice. Grading, purity, and other factors determine the value of gold coins – but investors must take great care when sinking money into the illiquid and opaque collectible market. Coins that are supposedly worth way more than their actual melt value should be avoided by everyone but experienced collectors. Instead, consider owning the most common and reliable, value-based gold coins when saving or investing your money. The official gold bullion coin of the U.S. is the American Gold Eagle. It was first released by the United States Mint in 1986 after being authorized under the Gold Bullion Coin Act of 1985. The design on the obverse in 1986 was Augustus Saint-Gaudens' depiction of Liberty. It is sold in both proof (most should avoid buying proof coins) and bullion finishes with a rendition of Adolph A. Weinman's Walking Liberty design. The weight of the bullion is usually used to describe Gold Eagle coins. They also have a marked face value, such as ten dollars on the ¼ ounce coin. Each year the Royal Canadian Mint produces the Canadian Gold Maple Leaf bullion coin that is issued by the Government of the Dominion of Canada. The standard gold Royal Canadian Mint coins weighs one troy ounce with a face value of $50 Canadian dollars. It is one of the purest gold coins in the world at .99999 millesimal fineness. Other sizes frequently sold inMaple Leaf Coins to investors include 1 gram, 1/25 oz, 1/20 oz, 1/10 oz and ½ oz. The obverse features a profile of Queen Elizabeth II of Canada with the Canadian Maple Leaf on the reverse. Security features were introduced in 2013 and 2015 that are only visible under magnification. The Australian Kangaroo is produced by the Perth Mint in Australia. The design features a standing kangaroo on the front and a head shot of Britain's Queen Elizabeth on the reverse. This gold bullion coin is struck from 99.99 percent pure gold, as well as one troy ounce fine silver or platinum options. It is also available in sizes such as 1 ounce that are made from 99.99% pure gold. Most of the countries worldwide switched from the gold standard by 1933 due to central bankers’ attempts to accelerate inflation and money printing during Great Depression. As a result, most mints around the world stopped making gold coins as a circulating currency. In the U.S. in 1933, the Executive Order 6102 forbade the “hoarding” of gold. This was followed by a devaluation of the dollar relative to gold. By 1971, the U.S. completely detached the dollar from the value of gold. Consider the rare 1933 $30 Double Eagle sold in 2002 at Sotheby's for $7,590,020, making it the most valuable coin sold to date. American gold coins minted prior to 1933 are not collectible (and can therefore be obtained near their actual melt value), but they are a wonderful way to buy a piece of American history. Plus, these pre-1933 gold coins are a solid investment without paying a collector's premium. if you would prefer silver, old silver coins for sale are very similiar to these pre-1933 gold coins. The Krugerrand gold coin was first minted in South Africa in 1967 and was produced by the South African Mint. By 1980, this gold coin accounted for 90 percent of the global coin market. Kruger is the man featured on the obverse and rand refers to the South African unit of currency. Production levels of the Krugerrand have varied over the past half century. They went down in the years associated with the apartheid government and are increasing again. These coins commemorate the famed Vienna Philharmonic Orchestra and the Musikverein Concert Hall where the musicians play. The Gold Vienna Philharmonic are widely-traded throughout Europe and around the world. Investors everywhere desire these lovely coins because they are unique in design, extraordinarily well made and carry the Austrian Mint's reputation for confidence and trust. The British Sovereigns is one of the least expensive ways to buy fractional sized gold coins. The Gold Sovereign is one of the most recognized coins around the world. The first of these coins were minted in 1817 and they remain in production today! A British Gold Sovereign (containing .2354 troy ounces of gold content) can generally be purchased for less than half the premium of the similar sized 1/4 ounce gold American Eagle. You won't find a better buy for coins with this great combination of small size and recognizability. As alluded to above, investors often make the mistake of buying so-called rare coins. These numismatic or semi-numismatic coins are meant for collectors, speculators, and hobbyists rather than people looking to reliably preserve and build wealth. Rare coin buying is exceedingly risky and often buyers pay inordinately high premiums and do not recoup their value. Rare coins are not really a gold investment… they are more akin to artwork. Some collectors buy coins for pleasure, because of their history or beauty, or because they have excess money to tie up in illiquid assets. Gold coins that are priced close to their actual melt value is a more prudent way to invest in precious metals. Gold bullion coins are issued as legal tender. When priced in Federal Reserve Notes or the un-backed currencies of other countries, their face value tends to be less than the value of the gold the coin contains. A $50 gold bullion coin could be worth much more based on the current value of gold on the spot market when priced in the Federal Reserve Note “dollar.”. The three-letter code for gold bullion, as set by the International Organization for Standardization (ISO), is XAU. Be aware of the value of gold before you pay the quoted price for it. The market value is based on the weight of the gold contained in the coin, which is often stamped on its reverse side. Research the spot price of gold, which is the current market value. It changes often and must be checked constantly. Gold is priced by the troy ounce but it can be purchased in many different increments, including a single gram. A troy ounce is 31.103 grams. To figure out the price of gold coins, multiply the spot price by the weight to determine the nominal value. Be aware this is not the usually the final price of the gold coin. The price is based on additional factors including purity, distribution charges, the cost of manufacturing, the quality of the finish and dealer gross profit margin. Once again, it is important to figure out the current market value of gold before you sell your gold coins. Only work with a reputable dealer like Money Metals Exchange which has an impeccable reputation. Be wary of online auction sites, such as eBay and Amazon, that can become gathering places for scammers. Look for attentive customer service and an SSL secured website with product pages that offer live buy and sell prices. An online dealer often offers a higher price for gold than a local coin shop and you can instantly lock in the price. Read online reviews, read each title and summary, and stay away from sites with one star to ensure you are working with a valid precious metals dealer. 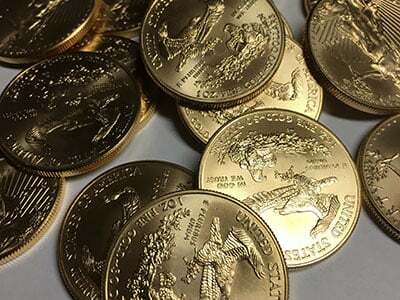 Visit Money Metals Exchange at MoneyMetals.com or call 1-800-800-1865 to choose from small, medium, and large gold bullion coins to add to your investment portfolio. Our professionals are available to help you through every aspect of the buying and selling processes.